Welcome to “The Ten Reasons,” where I discuss ten reasons why I like or dislike a particular game. You know how my contribution to the list of the fify best videogames of all time was really just a list of the first twenty-five games I could think of? Well, this column is basically just a list of the first ten things I can think of that are in Mega Man 3. 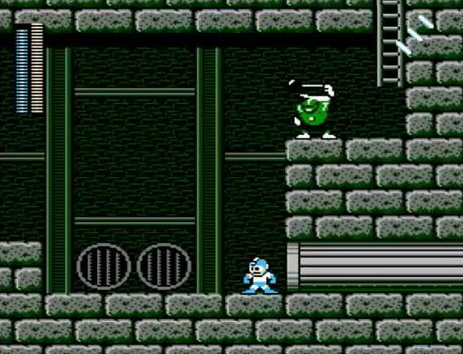 Those of you who are Mega Man fans (in other words, staff writer Nathaniel Hoover) may want to re-read my ten reasons for Mega Man and Mega Man 2 for some GameCola-style Mega Man fun that is not longer than the US Constitution. 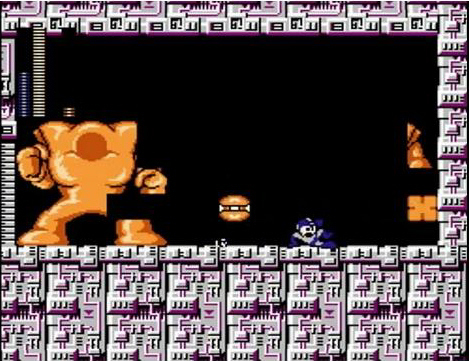 This game introduces a brand new mysterious enemy: Mega Girl. She has a fancy ponytail and a pink outfit that looks like his. Clearly, she’s Mega Man’s evil twin sister, and I think that’s cool. A lot of videogames have an evil doppleganger character for your hero to fight, such as Dark Link or Dark Samus or Shadow Mario, but I haven’t seen any that contain a doppleganger of the opposite gender beside Mega Man 3. Mega Girl’s backstory is kind of confusing because all her cutscenes were removed from the game, but she is the most brilliant addition to the Mega Man canon since…wait, what? Whoops. I have just been informed that the official name of this character is, in fact, Break Man. And/or Proto Man. Well, that certainly clears up the whole misunderstanding! Well, even if the character in this game isn’t Mega Girl, Mega Girl is still my favorite character in this game. Girl power! 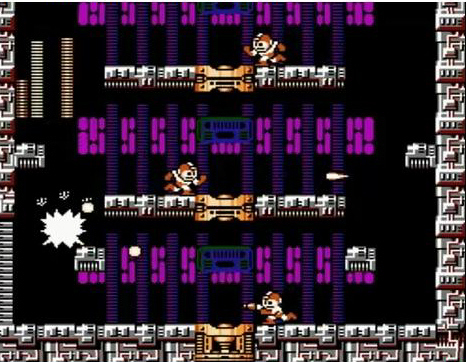 Halfway through the game, you have to go through four mystery stages before fighting Dr. Wily. 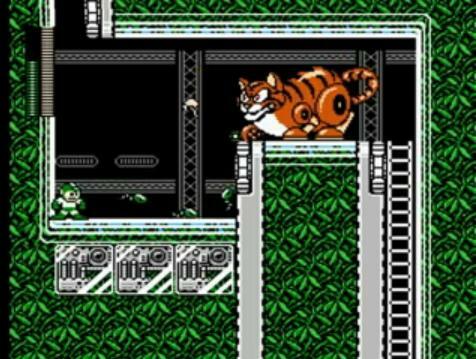 In these mystery stages, you fight the eight robot bosses from Mega Man 2, which is a really good idea. Having mystery stages? Having old bosses return? What a fun idea! …OK, so it was probably a mixture of laziness and rushed production that caused them to re-use old stages and bosses, but still. It works well. 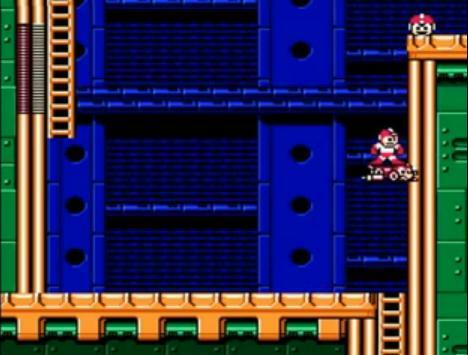 Dr. Wily’s underground lair has Mario pipes. It’s the crossover that was meant to be. Remember how Fire Man’s lair in Mega Man is based off Bowser’s castle? It’s sort of like that. 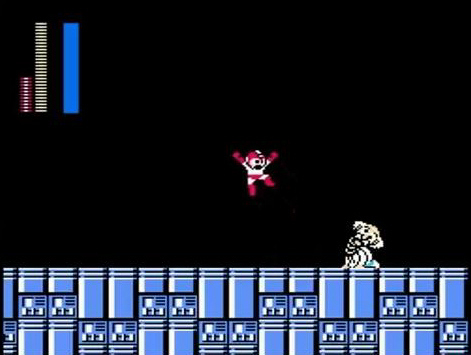 When you beat Wily, it is revealed that you have actually been fighting ROBOT WILY. That’s right, the game’s evil villain made a robot copy of himself! There’s no official backstory to the Robot Wily, but I imagine it goes something like this: Dr. Wily is in his underground lair, sleeping in his metallic bed. The alarm clock rings, and Dr. Wily gets up and yawns. Scratching his back, he says, “I don’t really feel like trying to take over the world today. I think I’ll send the Wily-bot to do it instead.” Then he goes back to sleep. In fact, I’m guessing this is how Dr. Wily pays for everything. Think about it. 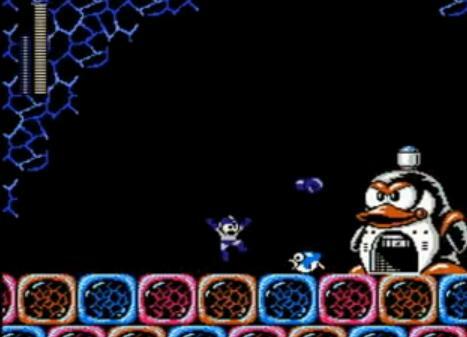 Dr. Wily gets a job at a McDonald’s somewhere, then he sends a Wily-bot to do all the work while he collects the paycheck. If he did this with, say, 100 Wily-bots, it would explain how he’s able to fund his evil empire without a large government grant. One thing bugs me, however. Why did Dr. Wily program his robot to get down on its knees and beg for mercy after it’s defeated? Did he expect his robot would get killed by Mega Man, or what? Rush is Mega Man’s robot dog, and he is in this game! Rush is a cool platform tool that you can use to fly to any part of the screen, which is super useful. Especially when you ride him across the top of the screen where there are no enemies. It’s not cheating! It’s fun! Also, I think I sang the “Riding on My Robot Dog” song three times while playing this game. There are robot penguins! And they attack you with…robot penguins! Go penguins! This game reuses two boss battles from Mega Man, but they are slightly modified here. For example, in the first game, there was one clone boss to fight. In this game, there are three. It’s a delicate balance, to be sure. On one hand, the battles have been changed to the point where they count as new boss battles and not repeats. On the other hand, they are similar enough to the original fights that you still get a sense of mini-nostalgia. Not that anyone has any fond memories of the original Yellow Devil fight, but still. It’s the thought that counts. I hate how they took away the slide move. Not cool! I want to slide! Sliding is fun! Ever since I was a little boy and Mommy took me to the park to play, I’ve loved slides. 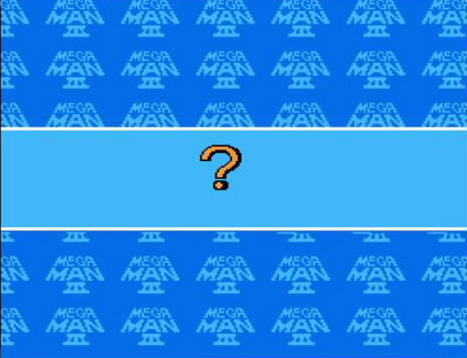 Mega Man 9 does not have a slide, so I think it is the worst game of all time. I played the GameCube version of Mega Man 3, which has controls that are so bad, they actively try to prevent you from winning the game. For example, the Start button does double duty as the “leave the energy selection screen” button and the “use an energy tank” button. So, naturally, when you try to leave the energy selection screen by pressing Start, the game thinks you pressed Start to use an energy tank and will probably waste three energy tanks in a row. Grrrr! So the power slide was not a useful ability for me. 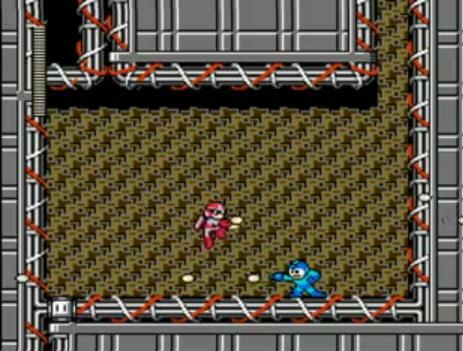 I’d get in a situation where an enemy was above me, and I had to slide to get out of danger, so I pressed the slide buttons, only Mega Man would jump right into the enemy instead of sliding because the controls are awful. After the first few times this happened, I vowed never to slide unless it was absolutely necessary. 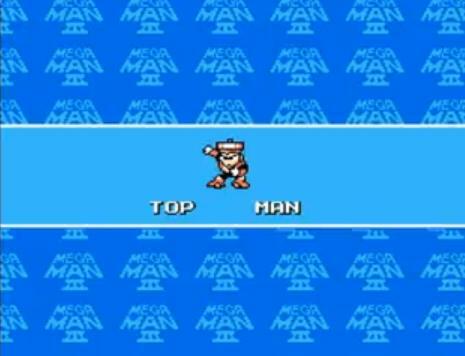 All Mega Man 3 players are legally required to dislike Top Man for being the worst robot ever. Nobody likes Top Man, his stage, or his weapon. OK, that’s not exactly true. I think the Top Spin is an awesome-looking weapon. After all, it involves killing enemies by twisting/twirling into them. Defeating bad guys with killer dance moves? Way to go, Top Spin! Top Man himself is still uncool, however. So those are the ten reasons for Mega Man 3. If you want to hear more of my opinions on this game for some reason, you can watch my video walkthrough for it on YouTube. See you later, everyone! 1. In screenshot #3, you are clearly fighting the Kool-Aid Man. As kid, I imagined him as Dreidel Man. While Top Man is pretty lame, he’s also pretty easy. Plus, his weapon is needed to kill Wily (unless you want to use Search Snake). He wasn’t THAT easy! That boss always… came out on Top! Your second paragraph made me laugh, Michael. Touché. Also, your assessment of the Robot Wily situation was brilliant. Hey, I have the GameCube version (I assume you mean the Anniversary Collection), and the slide has always worked just fine for me. And, while I did drain a few E-tanks on accident, I don’t think that was really the GameCube controlling badly (why does the game let you drink an E-tank at full health? ), it was just pressing the button when I shouldn’t have. Also, I am pretty certain that you can just B and it will exit the menu and not drink an E-tank. Overall, it seems to control perfectly fine for me. Also, I do have fond memories of the first Yellow Devil fight; finally beating him legitimately, and winning every fight since in an even better manner. Huh, you’re right. It just sound made up since that’s also a super hero. Still, I’ve only really played MM3 and 7 in full. Evil Kitty: sufficiently adorable AND dangerous. The opening was a little weak(“Hey let’s make fun of Protoman’s early color scheme by calling him a girl! Because nothing is worse than being a girl!”) But the rest of the article is pretty brilliant. You must’ve missed Michael’s original playthrough video where he honestly believed Proto Man was Mega Girl, despite everyone else in the fan community knowing otherwise. If anything, he’s making fun of himself.